NEW mums in the county can relax in the knowledge that the advice their health visitors give them about how best to look after their baby is as good as it gets. The Surrey Health Visitor team were officially handed the distinguished international UNICEF Baby Friendly Award at a recent ceremony held at the HG Wells Centre in Woking. 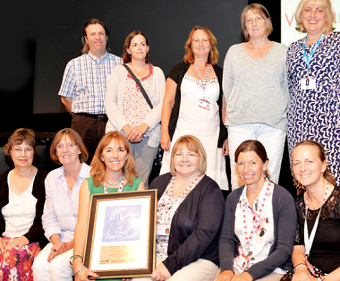 Part of the national NHS provider Virgin Care, Surrey Health Visitors are the latest UK service to win global recognition from the United Nations and World Health Organisation’s international programme, the Baby Friendly Initiative. Deputy Director Carmel Duffy presented the award to Karen Cridland, Virgin Care’s Lead for Universal Services. She said the team have demonstrated that they can meet set standards of providing practical and effective ways to improve the service they offer to mothers and babies. Health Visitors work with a mum and baby from before the birth until the child is two-and-a-half. They are responsible for monitoring both mother and baby’s health and providing advice on subjects such as breastfeeding. The team also attend support groups at children’s centres, where they answer questions, provide practical support and information. The award was announced after UNICEF assessors had monitored the Surrey team and spoken to mothers about the care they’d received. This was then measured against strict quality standards. The Baby Friendly Initiative works with services to protect, promote, and support breastfeeding and to strengthen mother-baby and family relationships. Maggie Pringle, Infant Feeding Co-ordinator, said: “We’re thrilled that the hard work of our health visitors in Surrey has been recognised by a prestigious organisation such as UNICEF. Carmel added: “Surveys show us that most mothers want to breastfeed but don’t always get the support they need. Virgin Care has provided the health visiting service since 2012.